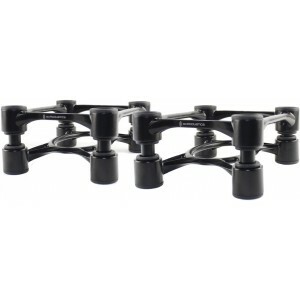 The Aperta Isolation Stands are made from alimunium rather than plastic as with lower ISO-L8R range and use a threaded height adjustment instead of pegs for more accurate adjustment of speaker level. Aperta is the new sleek range of sculpted aluminum acoustic isolation stands which have been designed specifically for medium-sized professional studio monitors and speakers. Aperta is the Italian word for "open" and describes the stylized design of the stands that produces open space to compliment the room. It also describes the spatial openness in sound and the crystal clarity in music that are delivered by the stands. The artistically designed Aperta stands raise the bar to set a new standard for remarkable acoustic isolation and performance. 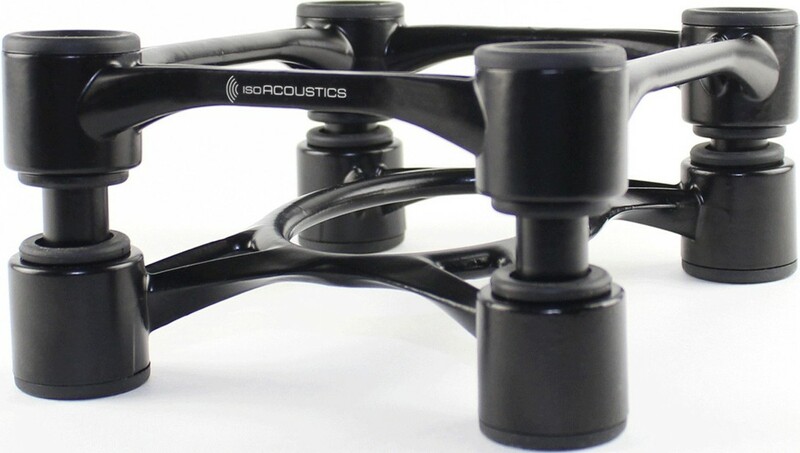 As with all IsoAcoustics award-winning isolation stands, Aperta provides an aesthetically pleasing and cost-effective means to markedly enhance the sound clarity and transparency of medium sized speakers, using the patented "floating design" that this company has become famous for. The new Iso Acoustics Aperta stands feature a unique integrated tilt adjustment that enables the user to dial-in the optimum tilt angle, with fine gradation markings provided to ensure the precision of the angle adjustments. You can choose between a 3" or 8" height when you set them up. With an overall size of 10" in depth and 7.8" in width, the Aperta stands complement medium size studio monitors and speakers weighing up to 75 lbs.